I like that slogan a lot. Especially since June 3rd is getting closer and closer every day. Yesterday, I went down to pick up my family's season tickets. First, I was blown away at how awesome the stadium is looking. From the goalposts being in place to the bench bubbles leaning up against the side of the stadium, it keeps looking more and more like a soccer stadium every time I see it. And, I get more and more anxious for June 3rd to get here. Add in a team that is off to one of the best starts ever in franchise history and the run up to June 3rd couldn't get much better. After wiping the drool off of my face, I opened up the white envelope with my tickets. I was curious to see what players would be featured on the tickets this season. The cover looked really cool with a big shot of the stadium. The "Your Team....Your Turf" slogan made me chuckle and think about all the FieldTurf vs natural grass debates that have taken place over the years. Then I saw it. 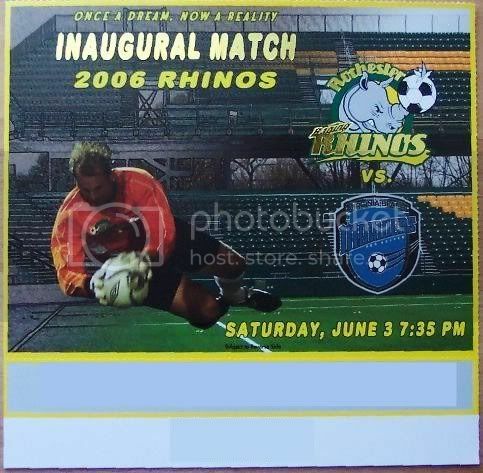 The ticket for the inaugural match that was 4 normal tickets wide. 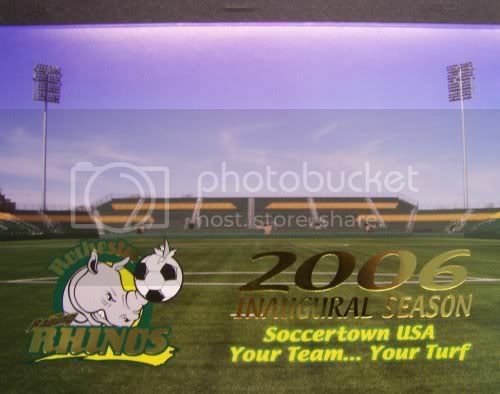 It was beautiful (The above picture doesn't do the ticket, or the cover, justice) with the picture of a diving Scott Vallow to the view of the Broad Street upper and lower decks to the gold embossed lettering and Rhinos logo. Thank goodness for barcode scanning technology that will allow this ticket to survive being used on June 3rd! I'm hoping that the premium gift for season ticket holders who paid for their tickets early is a nice blimp photo of opening night. I'd love to be able to frame a picture and the ticket together as a lasting memory for a night that has been a long time coming and shall be remembered for a long time, as well. A special thanks to Mark Pallo for the picture of the ticket booklet cover.